The de Blasio administration, under pressure to get homeless people off the city streets, has asked clergy throughout the city to make room for an additional 500 homeless people to sleep in houses of worship. At a meeting in lower Manhattan Thursday morning, city officials urged clergy to create so-called "Safe Haven" beds under a de Blasio initiative called Opening Doors. Unlike city shelters, which have strict rules and curfews and sobriety requirements, Safe Havens are more informal. The homeless can come and go and they don’t have to stay sober. The homeless are referred directly by street outreach teams and are admitted directly from living outdoors, skipping the city shelters' intake process. The city currently has 684 Safe Haven beds and wants to nearly double the capacity, asking houses of worship to set up another 500 beds. The city's homeless problem has been making a lot of headlines lately. Now city officials agree the public perception is correct that there are more homeless on the streets and fresh concerns on how to help them. Andrew Siff reports. "This is truly God’s work," Gilbert Taylor, commissioner of Homeless Services, told about two dozen clergy members at Thursday's meeting. 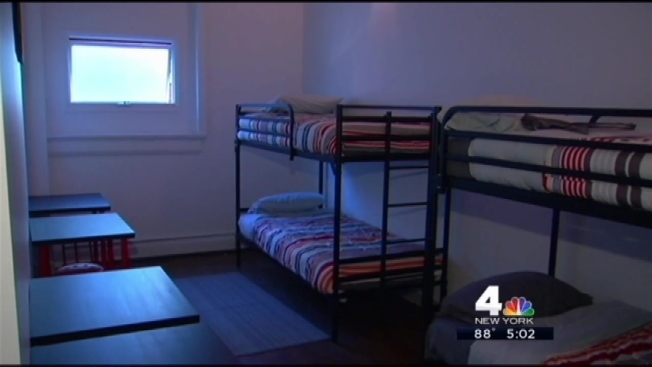 Assistant Commissioner Danielle Minelli Pagnotta told NBC 4 New York, "Churches have a lot of real estate in the city, and so space is easy to come by in their facilities." The Rev. Debra Northern of Riverside Church has responded to the call; she's setting up a Safe Haven at night in the church’s gymnasium. Northern, who's also a licensed social worker, says it's what the Bible says they should be doing. "Matthew 25 is a sort of Biblical mandate for caring for those who are on the margins, sheltering those who are without homes," she said. City officials say houses of worship have already committed to create 314 of the 500 new safe haven beds requested. The city has reached out to centers of all faiths. On the Lower East Side, NBC 4 New York met Guillermo Martin, who said he’s been homeless for five months. He said he would not consider entering a New York City shelter -- but would definitely take a bed in the Lambs Church of the Nazarene on Rivington Street, another newly identified Safe Haven under the de Blasio plan. There's new evidence that the city's homeless problem is growing. The 311 system is receiving thousands of more complaints than last year about homeless people. Melissa Russo reports. The city said it will sign contracts with the faith-based programs, and has a total budget of $19.5 million for Safe Haven for fiscal year 2016. The outreach budget for the same year is allotted at $15.7 million. Some experts in homelessness who asked not to be identified said while this is a helpful way to get people off the streets and into safer situations, safe havens are not an ideal long-term approach, since they don’t require sobriety or work. City officials insist social services will be invested in the safe havens.